for women’s rights and other reforms in the early 20th century. Lorraine Hansberry's first Broadway play, A Raisin in the Sun, changed how Black people's lives were shown in American theater. Lorraine Hansberry grew up in Chicago in the 1930s and 1940s. Because of a kind of housing discrimination called racially restrictive covenants, there were some neighborhoods where Black people were not allowed to live. The Hansberry family resisted that discrimination by moving to the edge of a white neighborhood. Angry white people tried to intimidate the family, and one day when Lorraine was only 8 years old, someone threw a brick through a window of the house and almost hit her. Lorraine’s father fought against restrictive covenants in court. In 1948 Hansberry started college at the UW-Madison, which had very few Black students. She was the first Black woman to live in Langdon Manor, a house for artistic female students. Seeing a play on campus by Sean O’Casey about Irish people inspired Hansberry to write about Black people’s lives. After two years, she left college and moved to New York, where she worked for a progressive newspaper called Freedom and wrote plays. The first play Hansberry finished, called A Raisin in the Sun, was about a Black family living in Chicago and struggling against racism and housing discrimination. A Raisin in the Sun opened on Broadway in 1959, where it was performed 530 times before closing in June 1960. Hansberry was the first Black woman to have a play produced on Broadway. It was later performed on many other theater stages, made into films and a musical, and produced on Broadway again in 2004. Fellow writer James Baldwin wrote that “never before, in the entire history of the American theater, had so much of the truth of black people’s lives been seen on the stage.” The New York Drama Critics’ Circle named A Raisin in the Sun the best play of 1959. Hansberry was the youngest playwright and the first Black playwright to receive that award. Hansberry wrote more works for the theater, including The Sign in Sidney Brustein’s Window, a play about a Jewish family, which was also produced on Broadway. Sadly, she died of cancer when she was only 34 years old. Her life and work, however, continue to inspire activists and writers today. Nemiroff, Robert. To Be Young, Gifted and Black: Lorraine Hansberry in Her Own Words. Prentice-Hall, 1969. Perry, Imani. 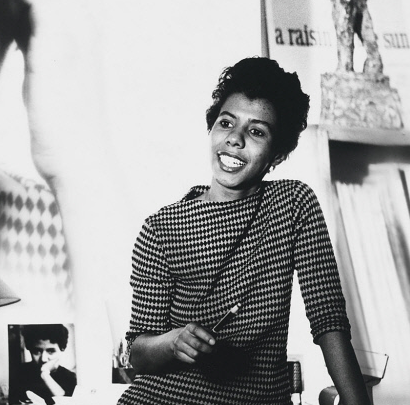 Looking for Lorraine: The Radiant and Radical Life of Lorraine Hansberry. Beacon Press, 2018. Many thanks to Käri Knutson, University Communications at UW-Madison, for her assistance with this profile.